Puliogare is known to be a specialty of south Indian. Mother’s Recipe captures the essence of the South in its Puliogare mix. Prepared using only the freshest ingredients, aromatic spices & a mother’s magical touch. Make the favourite authentic South Indian rice dish that is tangy and spicy with the flavour of tamarind or 'Imli' and peanuts. Tasty Tip: Best served with Papad, Curd and Coconut chutney. MTR Foods' Pullyogare powder can also be used for preparing Tangy Macaroni or Vermicelli. We are ranked amongst the best in the business and are engaged in offering an optimum quality range of Vangibath Powder to our esteemed clients. Our offered product is widely used in south Indian dishes with basmati rice and raw rice. Vangibath Powder is processed by using excellent grade of material with advanced technology. 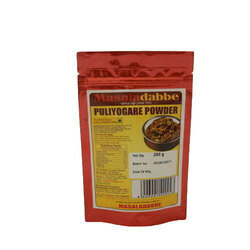 Puliyogare powder is made of chillies, coriander cumin, mustard asafoetida, turmeric bengal gram pepper fenugreek curry leaves, salt tamarind jaggery bengal gram black gram, vegetable oil dehydrated coconut and til. 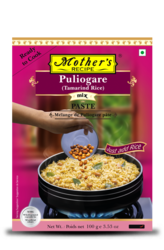 With quality puliyogare powder, make the well-known, lip-smacking south Indian vegetarian rice dish puliyogare. You can now make an authentic traditional rice meal for your family by just adding rice. The art of making good Puliyogare has always been a mystery. Now it has been demystified for the benefit of all. The retention of the unique South Indian flavour is what makes GRB's Puliogare so special. We are identified as one of the leading manufacturers and suppliers of a qualitative assortment of Puliogare Powder. These are processed under the favorable conditions using supreme class ingredients and latest technology as per the set industry norms. The offered powder is used to add taste in various south Indian delicacies. - At the lowest level in underground/ basement dig a pit (hole) and pump the water outside. - Clean the surface thouroughly. - Detect water leakage outlet points/ spots. - Fill all the outlet points/ spots of leakage with Nushar's Plugger Paste.